Appreciate the tranquillity of a refuge in harmony with nature. On the island of Menorca, surrounded by gardens replete with centenary and exotic species of trees and covering a vast 38 hectares, the country hotel Sant Ignasi, is the ideal place to enjoy moments of tranquillity and rest in communion with nature. The main building, which had once been the holiday home of an aristocratic family from the 18th century, has been transformed into a refuge at the guest’s disposal, decorated according to the style of the architect Pedro Mayans. The rooms, spread over three floors, recreate cosy, unique, colourful Mediterranean environments with some notorious British style influences. Some may offer a private garden, whilst others include a splendid balcony with views of the countryside, the Ciutadella and its bay. Of unparalleled location, the guests will find themselves a mere step away from the island’s exuberant beaches and will have at their disposal a large number of outdoor activities, like walks, horseback riding and water sports. For the true gourmet a visit to the Sant Ignasi restaurant, is recommended. 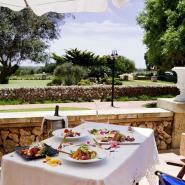 There the dinner can be delighted by dishes that combine the traditional delicacies of Menorca with the best signed cuisine. Afterwards, perhaps a cultural tour to visit all the Pre-historical monuments, the centennial cathedral and the town’s various charming palaces. From the airport, take the heading Puerto de Ciutadella and Cala Morel on the main road Mahón - Ciutadella. On the second roundabout take the exit for Puerto. 50 m from the next roundabout take the path on the right that has three flags indicating the way to Sant Ignasi.